After 11 years in detention, the Israeli occupation authority (IOA) released prisoner Mahmoud Abu Sorour, a resident of Aida refugee camp in Bethlehem. Abu Sorour was in jail on a charge of his involvement in resistance activities against the occupation and his affiliation with the Hamas Movement. According to a Palestinian Information Center (PIC) reporter, a rapturous reception was held for the prisoner and attended by officials from Palestinian factions, dignitaries, friends, and family members. Speeches delivered during the reception highlighted the issue of Palestinian prisoners in Israeli jails and their exposure to repressive practices at the hands of Israeli jailers. Some speakers talked about the mass hunger strike which prisoners intend to stage on April 17, which marks the Palestinian Prisoner Day, stressing the importance of supporting this protest step. The Bethlehem office of the Palestinian Prisoners Society (PPS), in the occupied West Bank, has reported that Israeli soldiers invaded, earlier Wednesday, the Deheishe refugee camp, south of the city, and Husan town, west of Bethlehem, and abducted three Palestinian teenagers, including a child, 15 years of age. The PPS stated that the soldiers surrounded the Deheishe refugee camp, before invading it, violently searched homes and abducted Mohammad Monjed Lahham, 18. 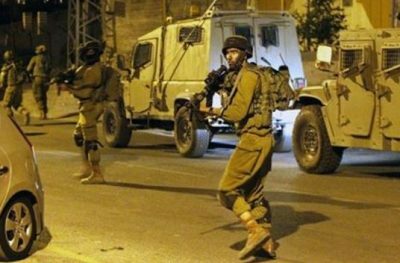 It added that the soldiers also invaded and ransacked homes in Husan village, west of Bethlehem, and abducted Mohammad Za’ouli, 17, and Bashar Sabateen, 15. Israeli soldiers abducted overnight and at dawn Wednesday, four Palestinians, from their homes, in various parts of the Old City of occupied East Jerusalem. The Palestinian Prisoners’ Society (PPS) said the soldiers abducted Sbeih Abu Sbeih, Mohammad Zghayyar, Jihad Qous and Rawhi Kolghassi. 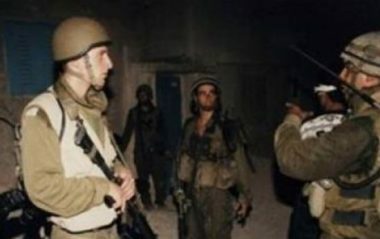 The Palestinians were taken prisoner after the soldiers invaded and ransacked their homes, and interrogated them and some of their family members. They were all cuffed and blindfolded, before the soldiers moved them to detention and interrogation centers in the city. Israeli soldiers abducted, on Wednesday at dawn, a Palestinian legislator, who is originally from Jerusalem, and a Hamas spokesperson, after storming their homes, in Ramallah, in central West Bank. 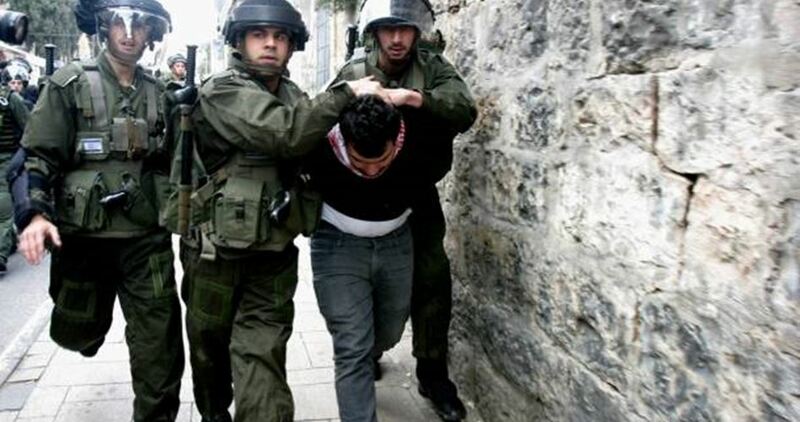 One Palestinian was also abducted in Hebron. 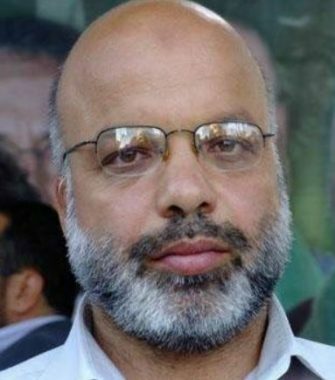 The Palestinian Prisoners Society (PPS) said the soldiers abducted legislator Ahmad Attoun, and Hamas spokesperson in the West Bank, Fayez Abu Warda, after violently searching and ransacking their homes, and took them to an unknown destination. It is worth mentioning that legislator Attoun is from occupied Jerusalem, but was forcibly exiled from the city, and has not been allowed to return. He was repeatedly abducted and imprisoned by Israel, spending at least ten years behind bars. The abduction of ‘Attoun brings the number of imprisoned democratically-elected Palestinian legislators, to 13, including senior Fateh movement leader, Marwan Barghouthi, and the Secretary-General of the Popular Front for the Liberation of Palestine (PFLP) Ahmad Sa’adat. In Hebron, in the southern part of the West Bank, the soldiers invaded Doura town, south of the city, and abducted a young man, identified as Hazem Khaled Khallaf, 24. 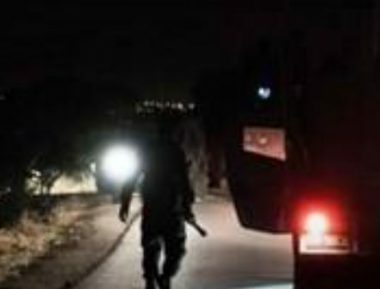 Israeli soldiers abducted, on Tuesday evening, a young Palestinian man from Hebron, after stopping him at a military roadblock, near Ramallah, in the occupied West Bank. The soldiers stopped the young man, identified as Mo’tasem Samir Breigheeth, 20, at the roadblock, while he was heading back home, in Beit Ummar town, north of Hebron, in the southern part of the West Bank. It is worth mentioning that Breigheeth is a student at a Palestinian college in Ramallah, and was heading home to visit with his family. The soldiers cuffed and blindfolded him, and took him to an unknown destination. 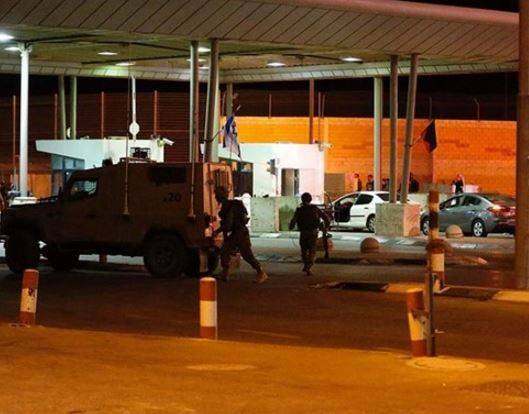 Israeli soldiers abducted, on Tuesday evening, a young Palestinian man from Sur Baher town, south of occupied East Jerusalem, in the West Bank, and took him to an interrogation center in the city. Media sources said the soldiers abducted the 20-year-old man, after stopping his car at a military roadblock, and searching it. The Israeli army claims that the soldiers located a “Carl Gustav” rifle, wrapped in a blanket, in the trunk of his car. 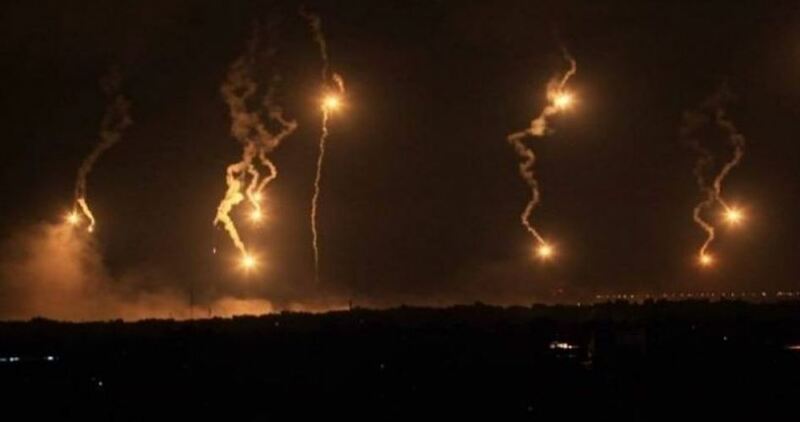 The Israeli occupation forces on Tuesday evening showered eastern al-Qarara in southern Gaza Strip with gunfire shortly before they kidnapped two Palestinian young men near the border fence. A PIC news correspondent said Israeli soldiers deployed at the Kissufim military base opened fire at eastern al-Qarara town, in eastern Khan Younis, at the same time as Israeli military patrols raked through Palestinian lands near the border fence, separating the blockaded Gaza Strip from 1948 Occupied Palestine (Green Line). The attack came shortly before Hebrew-speaking sources reported the abduction of two Palestinians by the Israeli forces as they allegedly attempted to creep into 1948 Occupied Palestine. The attack represents another chain in Israel’s violations of the ceasefire deal struck with the Palestinian resistance in the wake of the 2014 Israeli offensive on the besieged coastal enclave of Gaza. Israeli soldiers abducted, on Monday at night, a young Palestinian man in occupied East Jerusalem, after dozens of soldiers invaded the courtyards of the Al-Aqsa Mosque, amidst extensive military deployment in the area. The invasion into the courtyards of the mosque were largely made through the al-Magharba Gate, and the soldiers harassed many young men, before abducting one, shortly after evening prayers. The soldiers also invaded and searched the courtyards, and some of the mosque’s buildings, looking for Palestinians who remain in the holy site to prevent proactive tours by fanatic Israeli groups, conducted under heavy accompaniment of the police. Dozens of soldiers have also been deployed around the mosque, in addition to the streets and alleys of the Old City, while many Palestinians have been stopped, harassed and searched, and were prevented from entering holy Muslim site. The soldiers also held the ID cards of many Palestinians, who were allowed into the mosque, to ensure their departure later. 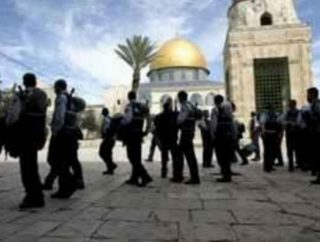 Meanwhile, fanatic Israeli groups, including the so-called Temple Mount Movement, have called for increasing the invasions and provocative tours into Al-Aqsa, and are planning larger tours, while many Islamic organizations have called on the Palestinians to head to the mosque, and remain there. 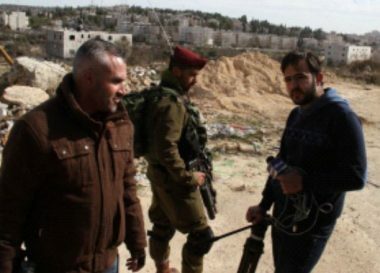 Israeli soldiers detained, on Tuesday morning, two Palestinian photojournalists, working for the WAFA Palestinian news agency, and the Palestinian Broadcasting Corporation, in Hebron’s Old City of Hebron, in the southern part of the occupied West Bank. The two were released later, after the soldiers searched them and their equipment, causing damage to one of their cameras. The Israeli occupation forces afternoon Monday kidnapped two Palestinian children from Ein al-Lawza neighborhood, south of al-Aqsa Mosque. According to Wadi Hilweh Information Center, the Israeli soldiers stormed Ein al-Lawza, in Silwan town, and cordoned off residential alleys, triggering clashes with Jerusalem’s anti-occupation youth. The Israeli forces attacked the Palestinian protesters with randomly-shot spates of teargas canisters and rubber bullets. Palestinian minors Malik Hesham al-Qaq, aged 15, and Omar Ezz Da’na, 14, were both kidnapped by the occupation soldiers in the assault. Palestinian young men and children have been frequently chased down by the Israeli forces on allegations of anti-occupation stone-throwing attacks. 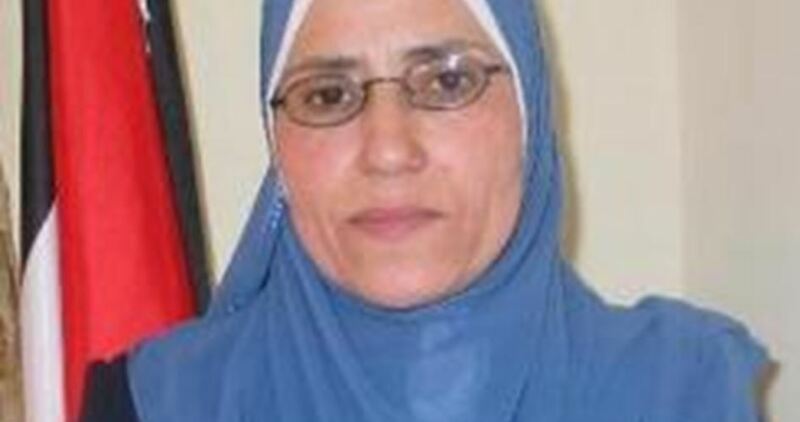 Israeli Ofer court decided on Sunday to release the Palestinian MP Samira Halaiqa on a bail, family sources revealed. However, the Israeli prosecution appealed Monday against the court’s decision and demanded its review. Halaiqa’s husband, Mohamed, said that the Israeli prosecution’s appeal prevented his wife’s release for the second consecutive time. Halaiqa was arrested last month for a number of fabricated charges including incitement on Facebook and involvement in “hostile” activities, in reference to her anti-occupation activism. She denied the charges, saying her Facebook account was hacked more than once. MP Halaiqa has been diagnosed with diabetes for over 20 years. She also suffers from vision problems and neurological disorders. The Israeli Occupation Authorities (IOA) extended Sunday the administrative detention of Sheikh Hassan Youssef, a Hamas-affiliated member of Palestine's parliament. 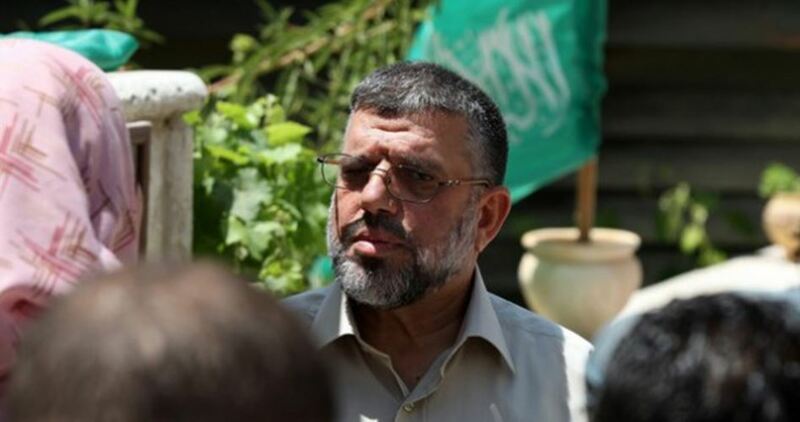 According to Hamas’s parliamentary bloc, Sheikh Youssef’s administrative detention was extended for three months for the fifth consecutive time only one day before his scheduled release. MP Sheikh Youssef, 62, was arrested on Oct. 20, 2015 after Israeli occupation forces (IOF) stormed his house west of Ramallah. Sheikh Yousef, who has spent 21 years in Israeli jails and was elected to the Palestinian Legislative Council in 2006 while in Israeli custody, has worked entirely in the political wing of the Hamas Movement. Meanwhile, the MP Ibrahim Dabour was sentenced to six months in administrative detention. MP Dabour was arrested at an Israeli military checkpoint west of Jenin on March 22. Over the past month, the IOF arrested three Palestinian MPs, bringing the total number of detained MPs in Israeli jails to 12. Under administrative detention, a procedure dating back to the British mandate of Palestine from 1920 to 1948, Israel can hold prisoners for indefinitely renewable six-month periods without charge. 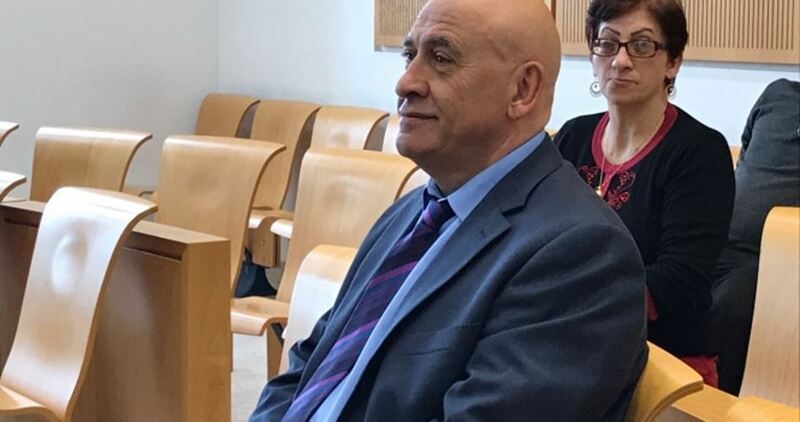 Joint (Arab) List lawmaker Basel Ghattas was sentenced by an Israeli court on Sunday to two years in prison and a 120,000 shekel fine, when the court accepted a plea bargain leading to his conviction for smuggling cell phones to Palestinian prisoners in Israeli jails. The Beersheba Magistrate’s Court accepted the plea bargain reached between Israeli prosecutors and MK Ghattas, who was convicted of exploiting his position to sneak cell phones and notes to Palestinian detainees. After accepting the deal, the court handed down a two-year prison term to Ghattas, as well as a 120,000 shekel fine. His sentence will begin on July 2, according to the court ruling. The conviction was found to carry moral turpitude, meaning he will be barred from serving in the Knesset for seven years after completing his sentence. Despite accepting the plea deal, the Israeli judge Itay Bresler-Gonen said the sentence Ghattas received was “easy” and a “deviation” compared to the sentences received by others for similar allegations. Ghattas came under criminal investigation after being caught on prison surveillance video passing envelopes to Palestinian prisoners in January. Shortly after, he had been sentenced to house arrest. Ghattas resigned from the Knesset last month. According to observers, Ghattas was being persecuted by the Israeli authorities as part of a crackdown on Arab members of the Knesset. 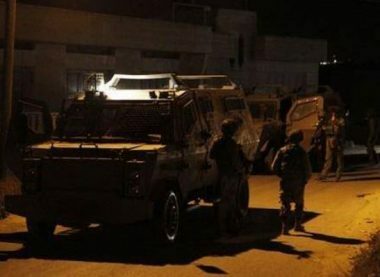 Several Israeli military jeeps invaded, on Monday at dawn, the village of Sanour, west of Jenin, in the northern part of the occupied West Bank, searched homes and abducted two Palestinians. 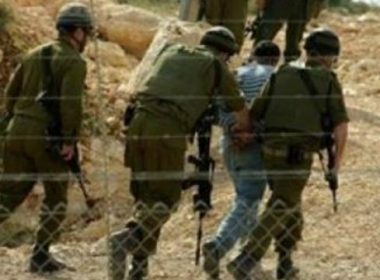 The Jenin office of the Palestinian Prisoners Society (PPS) has reported that the soldiers conducted violent searches of homes, interrogated many Palestinians and abducted two. The PPS said the abducted Palestinians have been identified as Ahmad Nayef ‘Ayasa, 25, and Mohammad Khaled ‘Ayasa, 23. 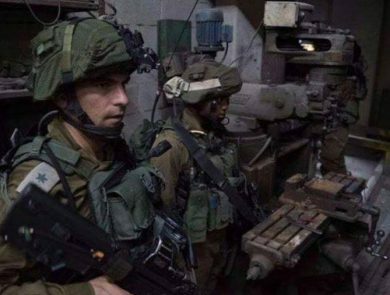 Israeli soldiers invaded, on Monday at dawn, several Palestinian homes, in the southern West Bank city of Hebron, violently searched them and abducted two Palestinians, in addition to confiscating machines from a lathe workshop. 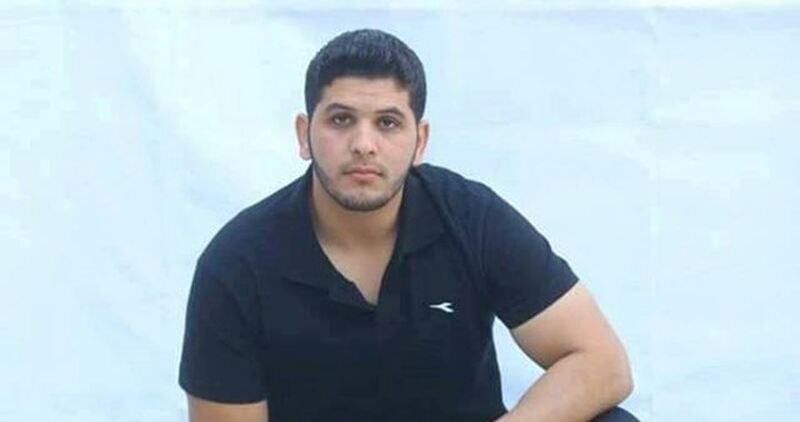 The WAFA Palestinian News Agency has reported that the soldiers abducted Rafat Maher Sharabati, from his home, and invaded his father’s lathe workshop, before confiscating machines and equipment. The soldiers also abducted another Palestinian, identified as Mos’ab Abu Turki, after invading and ransacking his home, in the city. Furthermore, the soldiers installed many roadblocks at the main roads leading to Sa’ir and Halhoul towns, in addition to Hebron’s northern road, before stopping and searching dozens of cars, and interrogated many residents while inspecting their ID cards.